Arncliffe is a small leafy suburb situated about 8km south of the centre of Sydney on the way to Cronulla, its many natural attributes are more than complimented by its considerable collection of fine period homes. The suburb is divided by a high ridge that can leave you with panoramic views over Botany Bay or across the city skyline, in some places you can enjoy both. The area is serviced with good public transport that gives access to the city by train in about 11 minutes, and a number of major shopping centres are to be found close by. But one of the best kept secrets of this little known suburb is its character, with period houses in lovely tree lined streets sorrounding beautiful parks. Wolli Creek and Bardwell Valley are areas of untouched natural bushland where residents can spend tranquil hours bushwalking. Even with its natural aspect, Arncliffe offers its residents a cosmopolitan lifestyle with a mixture of cultures living in harmony - a real village atmosphere. Many elderly residents have lived all their lives in Arncliffe - some can even remember the steam trams that ran from Arncliffe Railway Station up Wollongong Road to Bexley. The area has had its booms, but in particular it flourished in the 20 or so years after Federation - it was a much sought after area, especially by the gentry of the period. From about the depression until only just a few years ago though, the area was virtually forgotten. Only recently, young couples looking for their first home started discovering the wealth of untouched Federation cottages and Californian Bungalows with the odd Victorian Villa just waiting to be restored to their former glory, and for many they could now afford a piece of this country heritage many thousands of dollars below what was being asked in areas like Burwood, Balmain and Chatswood. The history of the area stretches back to the 1820s when James Chandler, who arrived in Sydney in 1820 as a free settler, purchased 100 acres of land near King's Grove, one boundry of which was the creek now known as Wolli Creek. In 1822 he was granted a further 1200 acres, next to his 100 acres, which he called Bexley, an area which would now cover Bexley, most of Rockdale, and much of North Bexley and Kogarah. Reuban Hannam, an ex-convict, was rewarded for his labors as the overseer of Government brickmakers, by becoming a landholder, with one grant of 100 acres along the banks of Wolli Creek. His son David Hannam, who played an important role in the development of the area, was granted territory just south of Cook's River. Although this grant was dated August 31, 1833, there is good reason to believe that, after his marriage at St Peter's, Campbelltown, in 1828, Hannam brought his bride to his Cook's River property. In that same year, 1828, Alexander Brodie Spark purchased Packer's Farm, on the south bank of the Cook's River and built a substantial sandstone residence called Tempe. Without a doubt, Tempe House is the jewel in the crown of the St George area. Built in 1836 for Alexander Spark, it used a design by John Verge. one of the great Colonial Architects. Verge also designed Tusculum at Potts Point, Camden Park at Camden, Denham Court at Ingleburn, Elizabeth Bay House at Elizabeth Bay and Toxteth Park at Glebe. This property differs in that it still retains almost all of its original grounds and even some of the original landscaping. For Tempe House, Verge used an Italianate style of striking composition incorporating semi - circular verandahed bays supported by wooden Tuscan columns. Pediment gables are a feature of the roofline. Spark chose the site after searching for " an area unspoilt by man". He named the area Tempe after the beautiful Vale of Tempe that lay beneath Mount Olympus in Greece. In 1988, the property was purchased by Qantec, a subsidiary of Qantas. Their intention was to restore Tempe House as part of the re development of the site but unfortunately that did not happened and unfortunately we did in that time see the demolition of the original girls school and its associated buildings . In the mid 90's the Tempe House site was re sold to a developer and this time thru the efforts of the Rockdale District Heritage Association council made it a condition of the development approval that Tempe House, the Chapel and the ground including Mount Olympus be restored as an early stage of the re develoment of the site. Tempe House is a rare and beautiful survivor from our Colonial Past. Its restoration and preservation, including that of its grounds, is of the utmost importance to all Australians and we congatulate all those involved in its restoration. David Hannam's property lay directly to the rear of Tempe. When Rocky Point Road and Forest Road were built, they both ran through David Hannam's grant. For years no name was given to the area, but it was eventually called Arncliffe. Surveys of the area were made by William Meadows Bronrigg, surveyor and draughtsman of Newtown, and a friend of Spark's. It is believed that he suggested the name, which means hard cliff, a reference to the rocky prominences and knolls that dominated the land and were to provide laborers with work through to the next century. In the early years of settlement the only way across the Cook's River was via a punt driven by Old Willy, Spark's boatman. Spark's wealth and generosity, and the beauty of his retreat attracted many settlers, though the access was difficult. At first, the southern side of Cook's River gave promise of becoming a most select area, peopled with gentleman farmers and wealthy merchants. However, by 1841, the economic depression caused large land owners to begin to break up their estates. In 1856, the land was being offered to "market gardeners and small capitalists". An experiment to dam Cook's River, to control the flow of sea water, led to the building of an earthen dam just east of the present bridge. The scheme failed as the dammed water stay brackish, but the dam provided a much needed bridge to the south and development progressed. The suburb of Arncliffe flourished from about 1890 to about 1935, at which time the majority of the houses were built, they are mostly Federation and Californian Bungalow in style with a spattering of Victorian homes. There are quite a few large Victorian and Federation Gentleman's mansions in the area, but like a lot of areas close to Sydney, it went through a phase of being unfashionable and became just another working class suburb, and has suffered from the tag of an ethnic enclave. But like the mythical Phoenix rising from the ashes, Arncliffe is starting to undergo a metamorphosis as people discover its proximity to the City Centre and to the beaches and it's wealth of untouched period homes. As more and more of these cottages are restored to their former glory, maybe, just maybe more people will come to appreciate the history and character of this area and the wonderful varied lifestyle that comes from areas where the residents no matter what their background get together to say this is a great place to live. 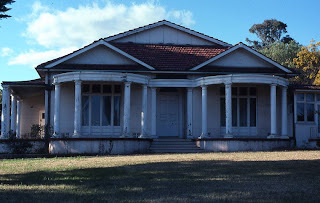 Over the last few years The National Trust and The Heritage Council have placed a number of properties on their various registers and Rockdale City Council and the Department of Planning have put in place a Local Environmental Plan to further protect some of this areas historic buildings. Hopefully this will bring about some positive guidelines, to help protect the area from unsympathetic development and to restore Arncliffe to its status as the beautiful Garden suburb envisaged by its forefathers. For more information on old houses and their restoration you can contact the Rockdale District Heritage Association either by email at rdha@netspace.net.au. The Association provides information about traditional colour schemes or period house restoration, other activities include history walks in the area.